In the wake of The Disaster Artist, the documentary Best Worst Movie, which was recently added to Amazon Prime, deserves a second look. Before Birdemic, The Room, and any number of other crimes against cinema, there was Troll 2, a Troll sequel that is neither a real sequel nor does it even feature any trolls. It’s a film that has been alternately described as what would happen if aliens tried to make a movie about humanity based on garbled TV signals sent out into space and/or the work of a semi-competent filmmaker who’d suffered a severe knock to the head right before every scene. Filmed in Utah by an Italian crew that didn’t speak any English and featuring a group of amateur actors trying their best despite having no idea what was going on, Troll 2 came out on VHS in 1990 and somehow found its way to a decade of steady rotation on cable and HBO. In 2009, one of the actors (in fact, the main star, Michael Stephenson) from the film made Best Worst Movie, a surprisingly compelling documentary about the production of Troll 2 and what’s become of everyone in the years since. At the time Best Worst Movie was made Troll 2 was undergoing a resurgence in popularity, the kind of popularity which would soon transfer to The Room. As such, it remains a vital insight into the so bad, it’s good phenomenon, both from a fan and filmmaker’s perspective. Before Best Worst Movie, Troll 2 was not a movie I’d given much thought to over the years. I first encountered it on cable at a time when I was still young enough to think the “Nilbog is Goblin spelled backwards!” reveal was kind of cool. Plus, all of the green goo (note: the film involves vegetarian goblins turning humans into plants before eating them because the screenwriter was tired of her friends pushing their vegetarianism on her) sure looked gross. Beyond that, Troll 2 was no more interesting to me than Zapped or any other B Movie I discovered through shows like USA Up All Night. Clearly, the so bad, it’s good appreciation gene some people seem to be born with skipped me. I somehow failed to appreciate Troll 2’s hilariously horrible dialgoue. In truth, my earliest memory of watching movies just to mock them is [and don’t judge me here] from an old Wings episode [okay – you can judge me if you want]. Steven Weber’s Brian stages something he calls “Samurai Theater,” which mostly entails renting old black & white Samurai movies, turning the sound completely off and improvising dialogue over the images on the screen, like some kind of ancestor to YouTube’s bad lip reading videos. Little did I know that in all likelihood whoever wrote that episode was probably a fan of something called Mystery Science Theater 3000, which had been airing for three seasons at that point and took the inkling of Brian’s “Samurai Theater” idea and elevated it into a more fully realized art form, cleverly mocking instead of simply substituting dialogue. My MST3K indoctrination didn’t come until much later, long after the show had left the air. Even then, while I laughed at the show I initially struggled with the “Isn’t this kind of cruel?” of it all. Then I saw Best Worst Movie shortly after it came out. Suddenly, I finally understood the so bad, it’s good people of the world who take possibly more pleasure in celebrating the trash heaps of cinema than elevating what’s more conventionally thought of as “good.” Like so much else with film fandom, it comes down to the communal experience and shared sensibilities amongst friends (and sometimes strangers). One by one, the interviewed Troll 2 superfans all recount cherished memories of discovering the film with friends, often times when they were young. It morphed from a bad movie into a childhood touchstone and seeped into their everyday vernacular and created years upon years of in-jokes as well as bonding experiences with new friends along the way, especially into college. Troll 2 certainly has all of those, and the fans in Best Worst Movie, ranging from comedians to horror movie producers who got into filmmaking in part because of a childhood love of Troll 2 to totally random people from around the world, dig all of that. Several excited fans in the doc describe Troll 2 in the exact same absolutes used by some people to now describe The Room, ya know, those people who will call it “the best movie ever” without any trace of irony. To some degree, this is nothing new. Older generations had Plan 9 and Rocky Horror; now we have Troll 2 and The Room. But the internet and the increasing specialization of home video has turned us all into pop culture anthropologists and given rise to a less serious form of film criticism that looks toward our cinematic failures for inspiration. As Nathan Rabin argued in My Year of Flops, “You can learn a lot about society by the pop culture it embraces, and just as much by what it angrily rejects.” These days, however, many film fans lovingly re-embrace what we used to reject. Perhaps this affords us a joyful sense of discovery often denied us with new films, most of which are wrapped up in Hollywood’s endless hype cycle. Perhaps it also comes down to identification. Few of us can truly identify with the giants of cinema who make masterpieces or at least highly successful movies, but a dreamer who got their movie made only for it to turn out epically bad? Yeah, that could be any one of us. 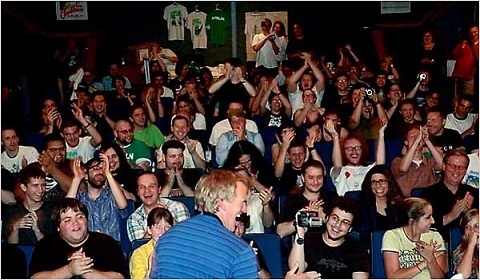 Best Worst Movie captures this trend in its internet infancy, which is enough on its own to make it a fascinating documentary, if already quickly dated (e.g., MySpace is referenced on more than one occasion, Stephenson’s 2009 camerawork could have been captured at a higher quality on a simple 2018 iPhone). But what really elevates the doc into the must-see category is the level of access Stephenson gains to his old castmates and director. Any fan could have made a Troll 2 documentary, but Stephenson’s connection to the material clearly opened some doors and led to several deeply fascinating/horribly depressing interviews. Not everyone was in a great place or knew what to do with/fully understood Troll 2’s resurgent popularity. More than once, a cast member at one of the screenings observes, “This is so great and so, so weird,” and they’re absolutely right each time. When Best Worst Movie was released, Troll 2 held the top spot on IMDB’s bottom 100. All these years later, it’s not even in the top 100 anymore. Incidentally, The Room isn’t on there either. People genuinely love these movies and/or find them so entertaining to watch and mock that they can’t rate them as being among the worst movies of all time. The worst thing a movie can be is not bad, but boring; Troll 2 isn’t and neither is Best Worst Movie, which runs a brisk 90 minutes long and manages to capture a subculture in its ascendancy and chronicle the unintended human cost. In the years since Best Worst Movie, Michael Stephenson made a second documentary, The American Scream, and a feature film for Netflix, the rather meh Bob Odenkirk black comedy Girlfriend’s Day. George Hardy will actually reprise his Troll 2 character later this year in Goblin 2, a crowd-funded German horror (unofficial?) sequel.